This page will have all the X2 Filter Wheel plugins I work on. These are mostly for OS X but some also work on Windows, Linux (Ubuntu) and Raspberry PI. As it's hard to get access to the real hardware, I'll give priority to whichever vendor is willing to help. If you own a filter wheel and want OS X or Linux support for TheSkyX Pro, let me know which one. If I can get the protocol documentation, I will try to write a X2 Plugin for it. The XAGYL filter wheels can be found on their online shop. In the settings dialog box, when you chose a slot to set the position offset, the wheel will move to the selected filter slot. 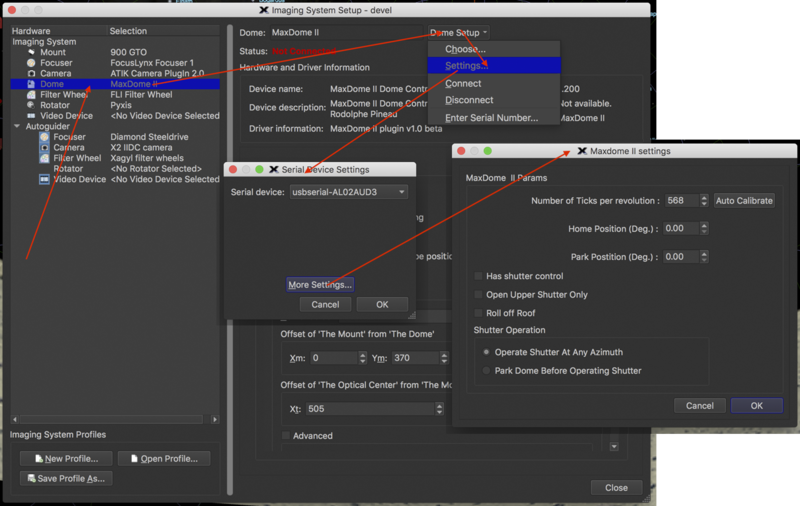 The filter position that was previously selected in TheSkyX Pro will be restored when you exit the setings dialog. When calibrating, all controls are disabled. After calibration, the wheel is set to slot 1. The Windows installer file : XAGYL Filter Wheel X2 Windows Plugin version 1.0. The RPI-3 tgz file contains the needed files and an INSTALL.TXT with the explanation on how to install it : XAGYL Filter Wheel X2 RPI-3 Plugin version 1.0. The Linux Ubuntu tgz file contains the needed files and an INSTALL.TXT with the explanation on how to install it : XAGYL Filter Wheel X2 Linux Ubuntu Plugin version 1.0. The plugin source code is available on GitHub : XAGYL Filter Wheel X2 Plugin sources. To compile the plugin yourself, you'll need the X2 Example code from Software Bisque. This is not required if you only want to install the plugin.